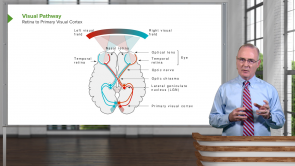 Visual Pathway: Anatomy of the Visual System – Video Course | Start free! Additional material is available for download, helping you to prepare for your USMLE Step 1 exam. Start now! 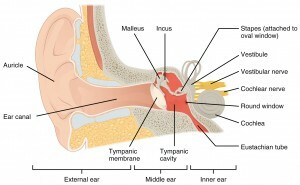 The sensory organs enable us to interact with our surroundings and perceive things outside our body. As fascinating as their function is, as complex and vast seems the topic during medical studies. Despite the large variety of sensory organs, they all follow a few fundamental principles in their structure and function. From the fundamentals to the necessary detailed knowledge of the different sensory perceptions is only a short way. Dr. Craig Canby is Professor of Anatomy at Des Moines University in Iowa. He studied Biology and Chemistry at the Iowa Wesleyan College and later got his Ph.D. in Anatomy at the University of Iowa. Canby has received many awards and honors for his work including the DPT Class of 2008 Teaching Excellence Award and the Award Hancher Finkbine Medallion. His research is especially focused on anatomical variations and technology-enabled student learning. This is nice a clear and well paced lecture. It's easy to understand. Thanks. After reviewing Neuroanatomy in FA and Kaplan, it is fair to say this lecture has delved deeply in some accurate key points of visual pathways.I really admire the fact that you guys have put on some quizzes in the end but I was surprised to see a red flag that goes unnoticed.In one of the question about the right lower optic radiations from the 5 listed, I saw right after radiation Meyer's loop in parenthesis which is clearly a mistake when it comes to asking questions.In the exam, they won't give any clues to test takers because they will have figure out themselves whether or not it is either Meyer's or Non-Meyers' loop. Explains it to a point where the visual pathway is simple.